It’s a most common question “How and when do I choose my hair accessories” and one that deserves careful thought and consideration. However, the condensed answer is simple: Choose what you love while taking a few key factors into consideration. 1.Your gown– it’s a must factor. It’s rare to find a bride who hasn’t already selected her gown. Does it have embellishment? A high or low neck line? Does it have any color in the fabric, or in the detail (a sash maybe or for example gold toned beading)? 2. What jewelry do you have already? You should have an idea of style at least. Stud earrings or dangle (how much dangle, a ½” drop or a fabulous chandelier style)? 3. How will you wear your hair? Your hair…I think most people would agree that you should feel like yourself only a more special, more carefully styled version of yourself, a version that makes you feel beautiful, glamorous, confident, & full of love! 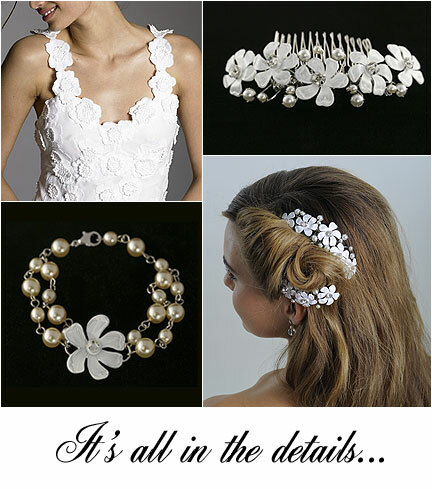 This isn’t always a must when selecting a hair accessory, but it does help guide the style you choose. I have actually had many customers who have all the details wrapped up including gown, jewelry, & hair accessory, but they wait on deciding on a final hair style until bringing their beautiful and sparkly jeweled comb to their 1st hair trial. The above image features the Lisette Gown from J.Crew, a sheer silk organdy fabric covered in embroidered cotton flowers. I paired this gown with two similarly detailed jeweled combs- the Dogwood Small Comb and the larger Dogwood Bridal Back Piece. Keeping the jewelry simple I added only the Dogwood Bracelet and would opt simple pearl studs for the earring choice. Do you have any questions along the way? I’ve touched base with customers as much as 6 months before they order perhaps just answering simple inquiries such as the possibility changing the size of a piece or location of a comb. Let me know if you have any questions, ideas, or pictures that would help make your decision! « Brides.com- Winter Weddings Story (We're Featured)! This is helpful – thanks! I have been struggling to figure out how to wear a veil in my hair. I have short hair in back so can not do an up-do, but have enough hair that could be pulled slightly on the side and top for a comb maybe? If you have any recommendations for short haired brides who would like to wear a veil to the ceremony and then remove it for the reception yet still have some bling in her hair, please let me know!! Hi! Thanks for your comment! I am sending you an email with a few pictures and suggestions.